Incredibly soft, this New Era Heritage Blend Custom Crew Tee will become your new favorite shirt! Add branding for your next event to ensure maximum exposure. If you are looking for the perfect tee that provides the perfect blending of softness with an easy going look, then these District Made Perfect Tri Crew custom t-shirts are what you want! This New Era Sueded Cotton Custom Crew T-Shirt has a soft vintage feel, like your favorite shirt you've worn for years! Imprinted with your logo, this shirt becomes a walking billboard for your brand. 100% ComfortSoft cotton 6.1 oz. 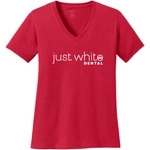 Hanes custom t-shirt offers a comfortable and tagless promotional t-shirt. For the perfect tee that provides the perfect blending of softness and comfort with an easy going carefree look to have your logo imprinted on to, then these District Made Perfect Tri Crew custom t-shirts are it! Perfect for the gym or a warm summer day, this New Era Heritage Blend Racerback Custom Tank Top is stylish and super soft. It layers easily with any outfit, ensuring great brand exposure. If you are looking for the perfect tee that provides the perfect blending of softness and comfort with an easy going carefree look, then these District Made Perfect Tri Crew custom t-shirts are it! These District Made Perfect Tri 3/4 sleeve raglan custom t-shirts offer an athletic inspired look along with the perfect blending of softness and easy going style. Ideal for sports teams and fans alike, this New Era Heritage Blend 3/4 Sleeve Custom Baseball Tee provides an on-trend look and ultimate comfort. It features shoulder and back yoke colorblocking and a scalloped hem. Your logo will be the center of attention on this window pattern tie-dye logo t-shirt. These District Made 3/4 sleeve raglan custom t-shirts are an athletic inspired look, yet offers the perfect blending of softness and laid back style design for both comfort and style! Ideal for sports teams and fans, this New Era Heritage Blend 3/4 Sleeve Custom Baseball Tee provides a great look and ultimate comfort. It features a heat transfer label and slightly rounded hem. Head out to the big game looking sporty and comfortable with these District Made Game custom t-shirts imprinted with your company logo. Next Level's fitted customized logo t-shirt exceeds all level of expectations with softness and fit.